BT VBM 2000 is rated 4.7 out of 5 by 7. Our most affordable video baby monitor. With manual pan and tilt, you can adjust your monitor so you never miss a moment. And with the 250m range you can always be in contact with your bundle of joy while you are moving around your home. Even keep an eye on your baby when the lights are down with our night vision feature. What's in the box? 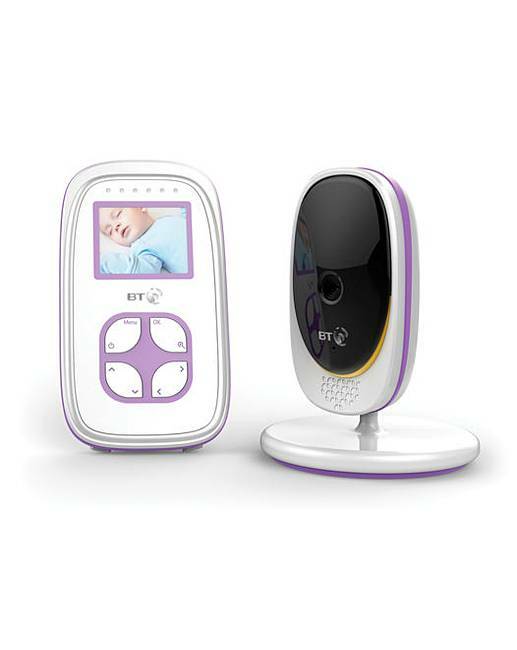 Video baby monitor 2000 comes with a parent unit for you, a monitor for the baby’s room, two mains power adaptors and a user guide to walk you through the set up process. High Quality 2 inch Screen, 250m Range, Night Vision, Lullabies, Manual Pan and Tilt. Rated 5 out of 5 by ChrisB from Does everything it says I purchased this for the times we babysit our grandson. We are able to put him down for his nap with no worries because we can see and hear him. Very easy to install, connects very easily and can be moved from room to room. I would definitely recommend this item to anyone looking for a similar system. Rated 5 out of 5 by Hannahb from Really good Really good clear picture (day and night) and sound, i have been using these for a few weeks and have no complaints at all. A lot of monitors will put the screen off if there is no movement or sound but i don't like not being able to glance at the monitor any time to check on my baby, this monitor has the option to keep the screen on all the time which is great!